The rich, flavorful low carb tart crust is made from almond flour and a little oat flour. You can make a sugar-free icing to decorate the tarts using powdered erythritol, xylitol, clear vanilla extract, and a little lemon juice. I don’t usually make the icing though, to be honest. These rich, buttery crusted treats with a sweet raspberry filling don’t need it. If you’re familiar with the sweeteners I use, you probably know that erythritol and xylitol can have a “cool” aftertaste in excess quantities. That’s why I’d skip the icing if I were you. To make paleo pop tarts, I’m guessing you could easily substitute tapioca starch for the oat flour, and coconut oil for the butter. A little honey could replace the erythritol. To make dairy-free pop tarts, you can substitute non-hydrogenated shortening for the butter. If you’re curious, the sprinkles are made of erythritol mixed up with Wilton food colorings. I mixed a drop of coloring into a little erythritol with a toothpick until it clumped. Then, I grabbed a little of the mixture and rubbed my finger tips together to distribute the “sprinkles” all over the tarts. Pretty cool, huh? If using sliced, blanched almonds, grind almonds in a Magic Bullet blender or food processor into a fine meal. If using blanched almond flour, simply add it to the rest of the dry ingredients in a bowl and whisk the mixture. Remove butter from fridge and cut into chunks. Use a fork to press butter into the dry mix, cutting it in so that you get pea sized chunks of butter throughout the dough. Whisk egg white in a separate small bowl. Drizzle in egg white a little at a time until the dough comes together. I ended up using just over half an egg white from 1 large egg. It’s better that the dough be a little dry rather than too moist! The dough should be crumbly, so you should have to press it together into a ball before refrigerating it. Chill dough for 15 minutes to 1/2 hour. If the dough is too crumbly to roll out, add a little bit more egg white and knead it through. Divide dough into 3 or 4 balls. Roll out a ball of dough into thin, square pieces between 2 pieces of parchment paper. I like to roll the dough a few strokes, then flip the parchment-dough-parchment package over. Peel off the top layer of parchment, then repeat the process, continuously flipping and rolling out the dough to make sure you can still remove the top piece of parchment from it. The technique is the same for my Sugar-Free Sugar Cookies. When the dough is thin enough, remove the top piece of parchment and use a pizza cutter to cut rectangles out of the dough. I use a big metal flat spatula to transfer the rectangular pieces to my parchment-lined baking sheet. I can usually get three 3.5″ by 4.5″ rectangular pieces of dough from one of the dough balls. Preheat oven to 350 degrees Fahrenheit. Brush the tops of the bottom halves of the tarts with left over egg white from the dough. Spread a tablespoon of filling over dough, leaving a 1/2″ margin of dough around the edges. Take spatula and transfer a matching rectangular piece of dough to cookie sheet, flipping it over onto the bottom tart piece. Press together the edges of the tart with your fingers to seal it. Use the tines of a fork to create a more decorative seal, if desired. Generously poke holes all over the top piece of the tart with a toothpick to avoid exploding pop tarts! Bake for 15 minutes if you’re going to toast the pop tarts later. 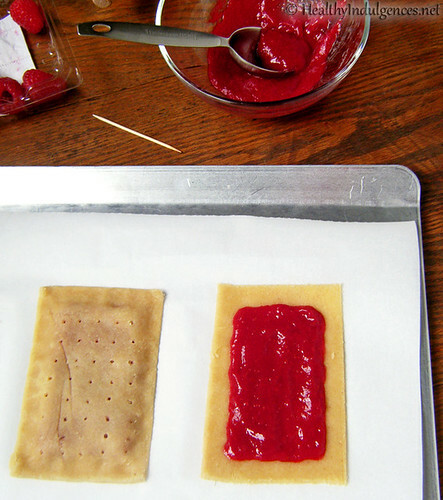 If you want to eat the pop tarts fresh out of the oven, bake ’em for 20 minutes, or until browned around the edges. Remove tarts from cookie sheet to cool on a wire rack. Add raspberries, lemon juice, stevia, erythritol, xanthan gum, and salt to a blender. I use my Magic Bullet. Blend until pureed. Transfer fruit puree to a microwaveable glass measuring cup. Microwave on HIGH for 4 minutes. Remove cup from microwave and allow mixture to cool. Whisk together the puree to even out the consistency before spreading on top of the tart dough. Makes enough filling for 6 tarts. « Announcing an E-COOKBOOK (!!!) and Instant Ice Cream and Hot Fudge Sauce for Sugar-Free Sundaes! 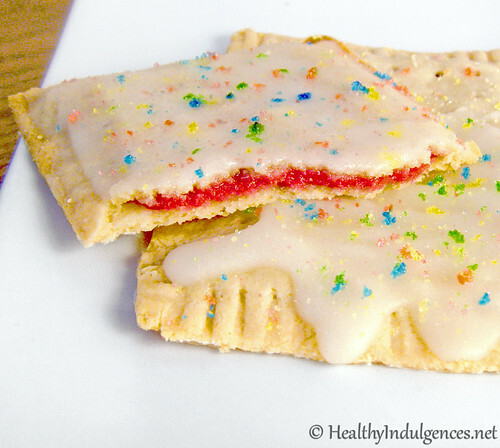 28 Comments on Homemade, Healthier Pop Tarts! A sugar-free and scrumptious low carb version of the breakfast treat. Haha, great minds think like, Brandon. 😀 Always good to hear from you. Hope your semester isn’t too crazy yet! I love your site. Is it possible to make these without the oat flour? We’re going grain free for awhile and I’d love to offer these to the kids for a treat during that time if possible. I’m flattered the picky eaters in your family like my treats, Alicia! 😀 Let me know how the pop tarts work out for you. Those look yummy!!! Thinking about using the dough and adding some finely shredded cheddar and a little more salt- and try to make Ritz crackers. The dough seem to be buttery and flaky enough, it might work! Been really missing those too! I’m sharing on my FB page now. Wonderful!!! I’m going to have to sub for the egg white for my allergic son, but Yippee!! Now I just need time to do this!! what did you use for the sprinkles on top? Wow! I can eat my favorite, sugary breakfast food on a low carb diet? Still can’t believe that. Now i just need to make them haha. Thanks for the recipe! I really love your recipes!, I would love to receive your newsletter/blog by mail, please. Hi, I love your recipes!. I’ve been looking for naturally sugar free butterscotch morsels/baking chips or a recipe. I would like to ask you a question about your homemade sweetener using stevia and erythritol. Where I can do it? Hi Frank, you can ask me via email at healthyindulgencesblog@gmail.com. I was wondering if this can solely be made with erytherol and no stevia? Because stevia is bitter to me. Unless it cooks not bitter? Thank you, I look forward to making it! One more Q 🙂 I noticed you use an oat and almond flour mix. How are the results different versus using one or the other and also using those particular amounts of each? And why does it need to be blanched? Thanks again! Can you replace the oat flour with anything else? Hey could you substitute the homemade filling for all natural Sugar free preserves? What is the total carbs…for those of us that don’t count net? Hi, your pop tarts look great. I tried to make this the other day but mine didn’t look as smooth as yours. In fact, they were a little crumbly. At first the mixture seemed too crumbly so I added some more egg whites. Then it was too wet. So I added a little more oat flour and baked them. Then they came out crumbly and not smooth like the ones in your picture. Asha, I’m going to work on this recipe over break. Thank you for letting me know how it turned out for you. I’m sorry they gave you some trouble! Hi, what can I sub butter/shortening for? I just made these today, with some changes because I didn’t have oat flour and I used raspberry jam for the filling. I did have quick cooking oats, so I put them through a processor until they became a flour. The tarts turned out okay, but almond flour just doesn’t taste or feel like poptarts… however, if you’re on a carb-free diet and you are trying to avoid giving into a craving, these will definitely fulfill that craving. I found the dough very difficult to handle as it was very fragile and crumbly. I was impressed though that it came out of the oven resembling a pie crust. I may use those recipe for a pie crust in the future. Had I been able to more closely follow your recipe with actual oat flour, I probably could have had a better pop tart.